October proved to be another bumper month for the field of people analytics, with the personal highlight for me being my fireside chat with Amit Mohindra on the main stage at UNLEASH where we discussed ‘The Moral Imperative of People Analytics’. Thanks to Amit for his wise words and to Leah Narodetsky, Marc Coleman and the UNLEASH team for making it happen and also for the opportunity to MC the main stage at what proved to be the biggest and best UNLEASH show yet. UNLEASH confirmed that people analytics is now a core component of strategic thinking around the future of the workforce and the HR organisation needed to support it. This can also be seen in the articles I’ve selected this month, which cover areas such as creating a data-driven culture, the role of the CHRO, the rise of organisational network analysis, the shift from HR strategies focused on people management to ones based on skills, the continued evolution of the employee engagement market, and a special selection of articles on algorithmic fairness in wake of the recent news that Amazon binned a hiring algorithm that was perpetuating bias against women. Creating a culture of analytics within the wider HR function is a critical step in achieving sustainable capability in people analytics. This article by Nigel Guenole and Sheri Feinzig is invaluable in this regard. First, the authors provide a smart categorisation of HR professionals that are analytically savvy, willing or resistant. Then their article describes ways you can hire for and/or develop analytical capability. With people analytics now becoming table stakes, this is a very helpful read. Having a CHRO that not only sponsors but is involved in people analytics is one of the key attributes I’ve witnessed in organisations that are the most advanced in the field. In her article, Lexy Martin outlines seven key responsibilities for CHROs to play an active role in selecting, enabling and modelling usage of people analytics within their companies. These include driving the vision for success as well as coaching business leaders on the value and outcome of analytics and establishing governance related to data privacy and ROI. A really helpful and practical guide to five key barriers that inhibit the progress of people analytics and the creation of a data-driven HR function. The article which describes barriers such as a lack of trust in data, an inability for companies to focus on solving real business problems and the very real risk of misunderstanding the basics of data. The advice offered by contributors to the article – particularly Alexis Fink but also Michael Housman, Alec Levenson and Dan Staley provide a good guide to organisations seeking to overcome these obstacles. Only 11% of business leaders trust HR to use data to anticipate and help them fill their talent needs. That's the worrying finding in the 2018 DDI, Conference Board and EY Global Leadership Survey featured in this article by Evan Sinar, Rebecca Ray and Adam Canwell. The authors offer four steps for HR leaders to improve their data literacy: i) Forge internal partnerships, ii) Map analytics to business outcomes, iii) Develop data visualisation skills, and; iv) Implement leadership planning models. In this article from the November-December issue of HBR, Paul Leonardi and Noshir Contractor state that most people analytics teams rely on a narrow approach restricted to data on individuals. They argue that if the field is going to live up to the hype, people analytics teams need to also explore data on the interplay between people to understand how they interact, who has influence, what fosters innovation etc. The result is one of the best articles I've read yet on the case for passive organisational network analysis (or as the authors describe it in the article – ‘relational analytics’). The Six Signatures of Relational Analytics that is presented (see Figure 3) covering Ideation, Influence, Efficiency, Innovation, Silos and Vulnerability is a powerful starting point for people analytics teams looking to mine the digital exhaust of their workforce. The future’s bright, the future’s ONA. Continuing the ONA theme, in the first of his two entries this month, Josh Bersin highlights some of the vendors driving innovation in the space such as Microsoft, KeenCorp and TrustSphere (see Figure 4 below with regards to onboarding). The multiple use cases that Josh outlines include how ONA can provide insights on critical areas such as productivity, innovation, trust, influence, collaboration and engagement. Josh also describes a Case Study from Praful Tickoo of how Genpact studied the communication patterns of 650 leaders and found a 74% statistical correlation between communication patterns and the highest levels of individual performance. Praful also used ONA to help Genpact accurately predict flight risk six months out by picking up signals from employees of being less engaged in their communications. For more on ONA including several case studies, please read my The Role of ONA in People Analytics primer. You also might want to read this case study from Francisco Marin on how ONA helped accelerate a multi-million dollar merger of two telecom companies in Europe. In the not too distant future I believe that the GDPR will be seen as a positive for people analytics as it should help curtail projects that are simply 'creepy'. For that to happen, HR must take ownership of GDPR, embrace the new responsibilities and use the legislation to add value to the business. Kim Bradford is not only an expert on the GDPR but is also a HR practitioner, and her article offers practical guidance for HR on how they can seize the opportunity offered through GDPR. Her message that "HR is an ideal business partner for implementing GDPR compliance within businesses" certainly resonates. Kim has recently launched a course on GDPR for HR professionals here on myHRfuture. Click here to find out more. Two articles from people analytics leaders. A superb guide from data scientist Brian Richmond, who founded the people analytics team at WeWork, on how to predict employee turnover Using R. I frequently get asked for practical guides such as this, and Brian's article is detailed, well-written and highly educational. As Brian writes, employee turnover is a challenge for many organisations, so this is likely to be an indispensable resource for many budding people analysts. Amit Mohindra may be the only person to have been the people analytics leader at TWO Fortune 5 companies as he has first at McKesson and then until recently at Apple. His experience in the field is second to none and this article recounts how he first got into the space, and how this path led to his eventual appointment as Manager, HR Strategy and Analysis at a Wall Street firm. Along the way, Amit provides several tips (such as the need for leadership buy-in, and for hiring people with deep, unique and complementary skills) and describes how he overcame several hurdles (like poor HR systems and data infrastructure). It’s a wonderful read and one I’m sure that will resonant with many practitioners who ended up in this field we now call people analytics. Two studies that focus on the unstoppable rise of artificial intelligence. The first study from McKinsey provides a broad view on the opportunities and challenge of this new age, with one of the six focus areas investigated being the profound impact AI and automation will have on the world of work (see Figure 5 below). The key takeaway from the study from a people perspective is that workers will need different skills to thrive in the workplace of the future. The second study from Bain puts the lens squarely on HR and provides numerous insights not least that whilst no facet of HR will remain untouched by digital, the vast majority of organisations are only in the early stages of transformation from a workforce perspective. 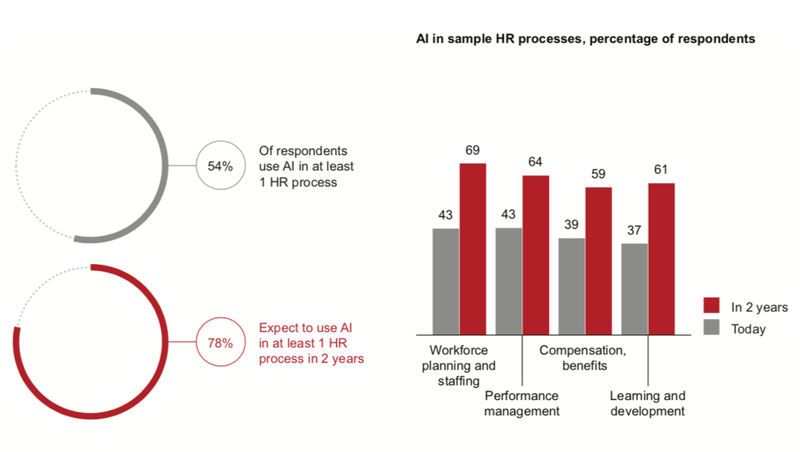 Despite this haphazard progress, the study found that 78% of companies plan to use AI in at least one HR process by 2020 (see Figure 6). As the McKinsey and Bain studies both make clear, managing skills effectively will be key for organisations in managing their workforces of the future. In this article, Volker Jacobs presents a model that incorporates nine key parameters for organisations looking to shift HR from a focus on people management to one of skill management (see Figure 7). What makes this even more powerful and relevant is the fact that Volker and his team at TI-People co-created the model together with 20 member companies. Josh’s second entry on the countdown this month plots a course through the history of the employee engagement market. He argues that with the launch of Humu – which Josh refers to as the first behavioural company in our space – the engagement market has reached a third major evolution (see Figure 8) that could even see disruptors like Culture Amp, Glint (now owned of course by LinkedIn) and Peakon being disrupted themselves by Humu and other players that will doubtless enter this market. An absolute must-read. "In stage 3 we are going to leverage the power of AI to turn feedback and ONA data into prescribed organizational change, using nudges suggestions to make work better"
Just as digital technology has transformed the customer experience so is it now entering the workplace in the form of the consumerisation of HR. In this article, Soumyasanto Sen outlines how companies are redesigning HR to provide positive touchpoints at every stage of the employee lifecycle. He emphasises the need to balance automation in some interactions with the desire from employees to have more human interaction in other HR-related tasks (see Figure 9). This blend of digital and human is perhaps best encapsulated in the evolution of how organisations are developing employee experience with technology enabling the personalisation of HR services to its workforce. A really good article and one to read alongside the earlier ones from Josh Bersin and Volker Jacobs. ALGORITHMS – FRIEND OR FOE? The recent revelation that Amazon scrapped a hiring algorithm that biased against women (see here) has prompted a glut of articles on the pros and cons of using algorithms not just for hiring, but in all areas of people management. As Cathy O’Neil writes in her typically robust piece it’s worth remembering that “What makes Amazon unusual is that it actually did its due diligence, discovered the troubling bias and decided against using the algorithm”. Glen Ford reminds us that “Algorithms that are biased will end up doing things that reflect that bias,” before outlining four distinct types of machine learning bias that we need to be aware of and guard against. As part of his brilliant series on machine learning, Keith McNulty provides a step by step guide to assessing whether an algorithm is effective or not. Finally, Charles Amick’s piece provides guidance on four ways to continuously improve your algorithms. This seminal paper provides a critique of the HR centric approach adopted by many organisations when it comes to analytics, instead advocating an “outside-in” method targeted at solving real business problems. Two excellent examples from Maersk Drilling are highlighted to support the argument. Case 1 examines the impact of leadership quality and crew competence on safety, operational performance, and customer satisfaction (see Figure 10) whilst Case 2 examines the ROI and Strategic Impact of a Technical Trainee Acceleration Program. Both cases show that analytics is far more effective when tackled from a business (rather than an inward-looking HR) perspective and that analytics needs to be treated as a change management process. The guidance offered by Dave Ulrich and Thomas Rasmussen in this article is still highly relevant to the state of people analytics today. Gustavo Canton, who leads people analytics at Schneider Electric, joins Chris Rainey on the HRD Leaders Podcast to walk through his career journey from marketing to people analytics. He offers a number of helpful insights to new people analytics leaders and those looking to accelerate their progress. ROSA LEE - How do you build a data-driven culture in HR? I had the pleasure of interviewing Rosa Lee at the recent Insight222 Global Executive Retreat in Philadelphia about her experience of developing people analytics at Bosch, and of taking that critical step to build a data-driven culture in HR. Read the transcript in the link to Ian Bailie’s piece above and watch the video below.